I love to make burlap ribbon. There are so many fun uses for it, especially during the upcoming holidays! It is so quick, easy, and inexpensive to make too… which is always nice! I used my 40% off coupon at the fabric store for regular natural colored burlap and I only paid $2.40 a yard which equals out to being only 17 cents a yard for 3″ burlap ribbon!!! And, in case you are wondering, you can get 14 yards of ribbon per single yard of burlap! Not bad! 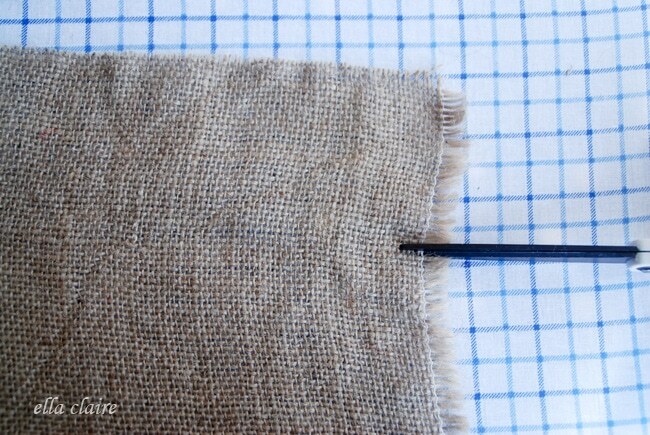 After you have straightened out one side of your burlap, measure the width you wish your ribbon to be and snip a little cut in the end seam. 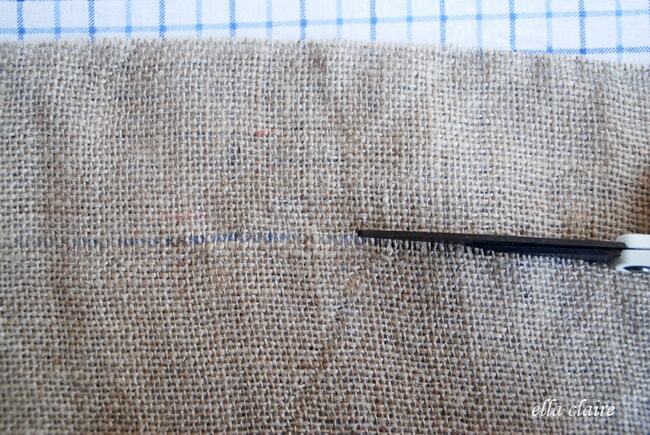 The missing thread line will serve as guide to cut your burlap to get that nice and perfect edge. 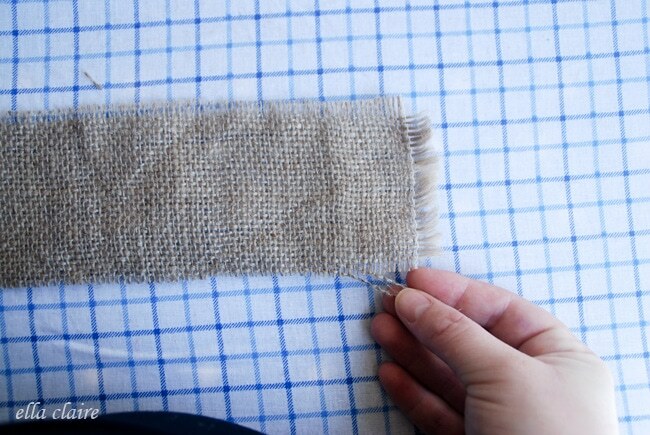 Once you have cut your ribbon, pull one or two more threads off of each end. And you are finished! Quick, cheap, and easy!! The possibilities for crafting with these ribbons are really endless!! 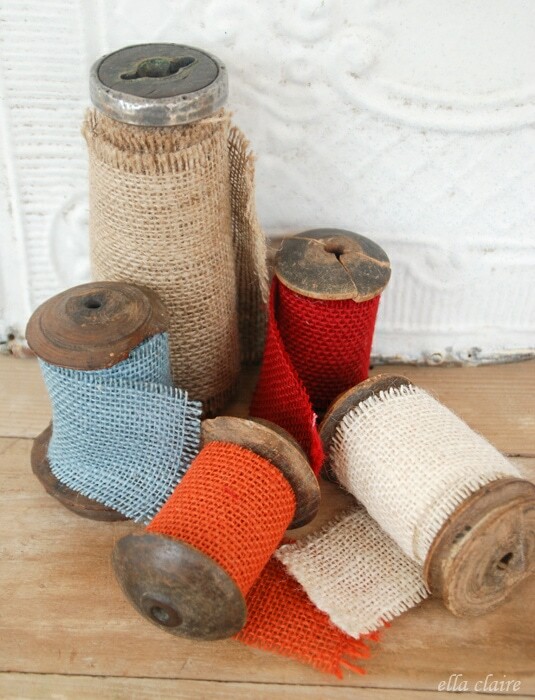 If you don’t want to make your own ribbon, you can also purchase pre-made burlap ribbon through burlapfabric.com here. One of my favorite things to do with burlap ribbon is to wrap presents with it because it adds so much richness and texture. I will definitely be doing some of these this Christmas. Kristen – I do that with burlap also. It is so quick and so much cheaper. Great tutorial. What a great idea! I’ve got a boat-load of burlap, I must try this! What a wonderful idea, so pretty and perfect to have on hand for all things burlap! 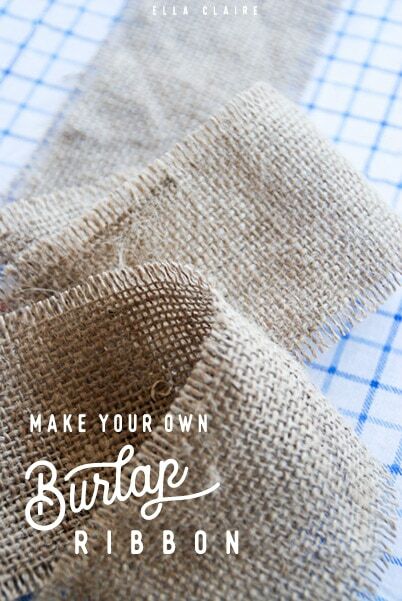 This is a wonderful idea… takes a little more time, but worth it if you are doing a lot of burlap projects. Looking forward to the burlap linky party!!! Great idea, I love using burlap at Christmas. 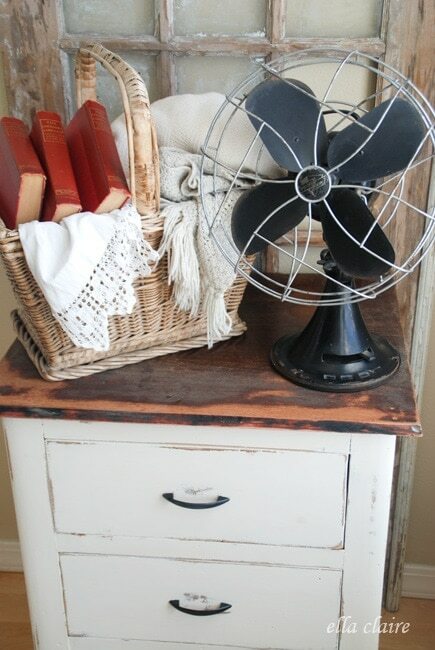 I also Love your vintage spools… So cool! Darling, Kristen! What a fun idea. I’ve pinned to my Beautiful Burlap Pinterest Board. 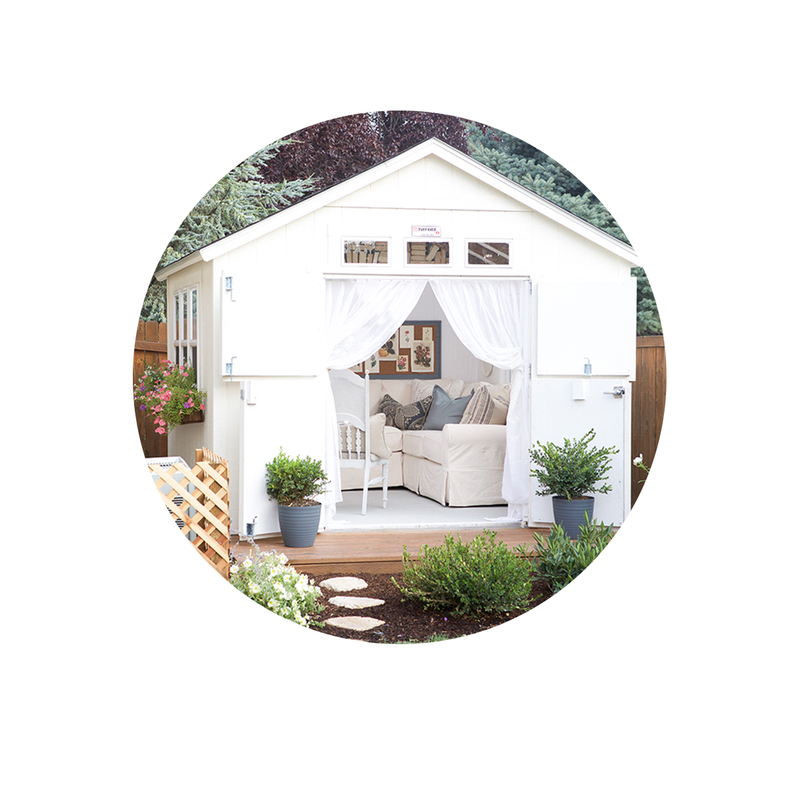 Thrifty and pretty – my favourite combination! You don’t use fraycheck to keep it from unraveling. This is so pretty, Kristen, and what a great idea! Love it. wow! Great idea!! 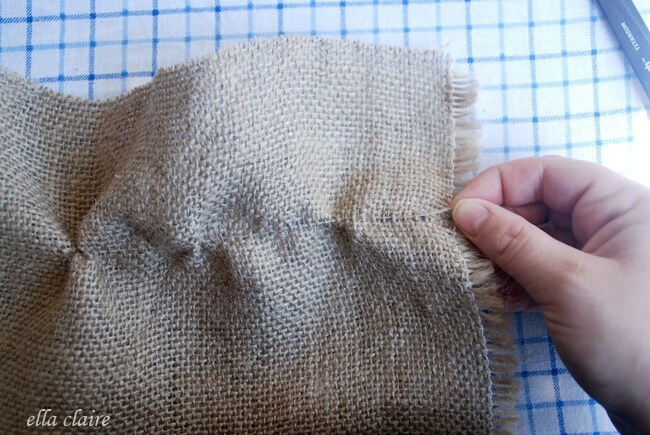 By the way, which is the cheapest way to get a lot of burlap, do you know? Would I have to get it from where JoAnn’s gets it? Need it for a large gardening project. Love this idea! 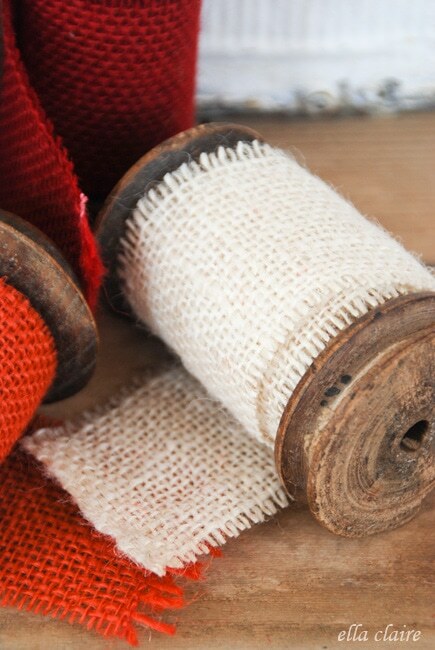 So great to have spools of this on hand for the upcoming holidays! Your pretty wrapped present is adorable too! Pinned! Where, O’ Where did you find the wooden spools?? i love those! 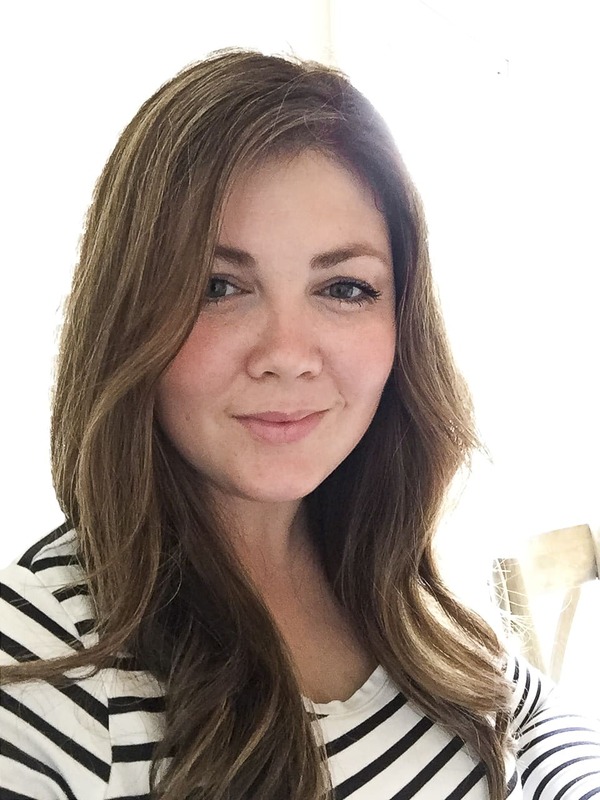 new to your blog, and lovin it ! 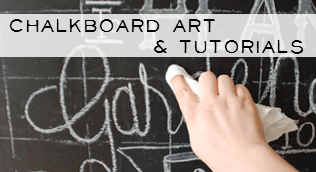 Brilliant tutorials, just found you on Pinterest and became a follower. 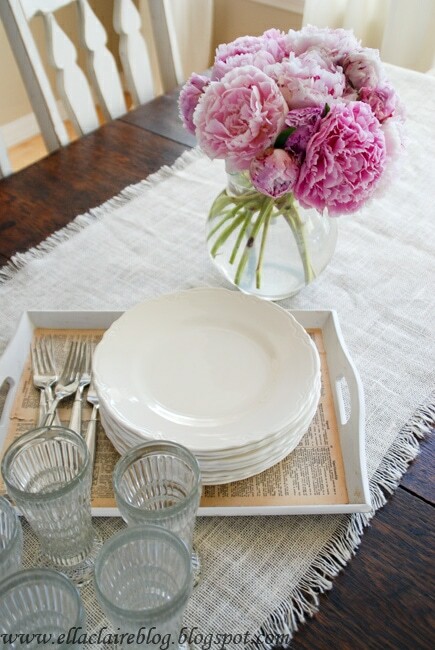 Can’t wait to try these ideas with my burlap. 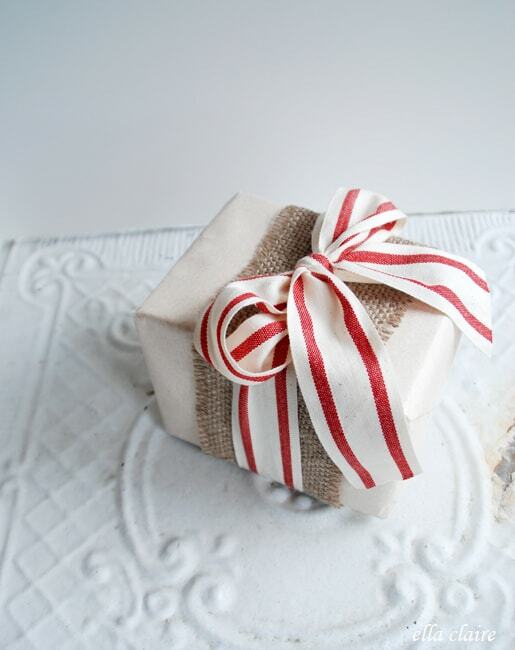 I just adore your wrapped package, and the burlap ribbon is inspired! But, where did you find the red and white ribbon? It’s the cutest stuff I’ve seen! Yes, the whole idea is wonderful. where did you find the red and white ribbon? How wide is it? Great idea to make yardage into ribbon! Nice. I love the wooden spools you’ve wrapped it on too! A couple of them look like bobbins from a spinning wheel – do you spin, or did you just buy them somewhere? LOVE! PS found you via pinterest…maybe FB first. 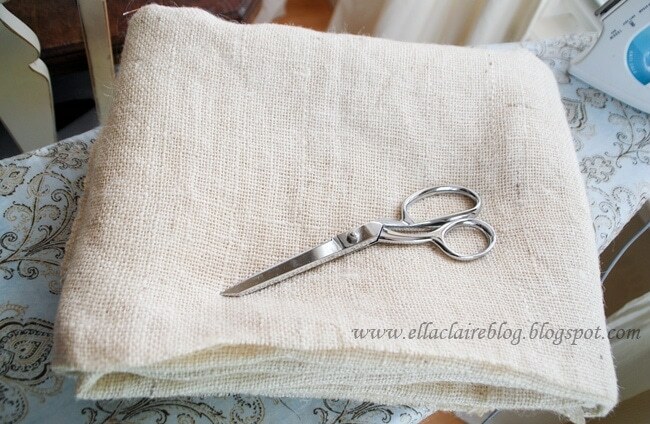 Do you wash the burlap before cutting it for the ribbon? Or does that make it too soft?